This past week has gone by in a blur of last minute Christmas shopping (okay, maybe not that last minute as there’s still one week to go), clubs, and generally trying to keep warm! We’re very excited as it feels like the Christmas holidays already, but in reality hubby still has to work a couple more days before it’s officially Christmas. All of Little M’s clubs have now finished for the Christmas break, so it’s full steam ahead now for me to spend her nap times customising her ikea play kitchen ready for Christmas day. I’ve bought some spray paint and primer but I’m super nervous as I totally messed up some shelves I tried to spray paint for her bedroom – so I’ll be praying while I’m spraying that it turns out okay! At the weekend we braved the cold, wrapped up warm and headed to the park for a play, which is where I took this week’s photograph. Thankfully, Little M likes wearing her winter hat, which is a vast improvement from the summer when she point blank refused to wear a sun hat for more than thirty seconds! She also likes wearing her gloves, which are absolutely enormous, but that was the only size they had in the shop so we went with it and will hope that she gets a couple of years’ wear out of them! 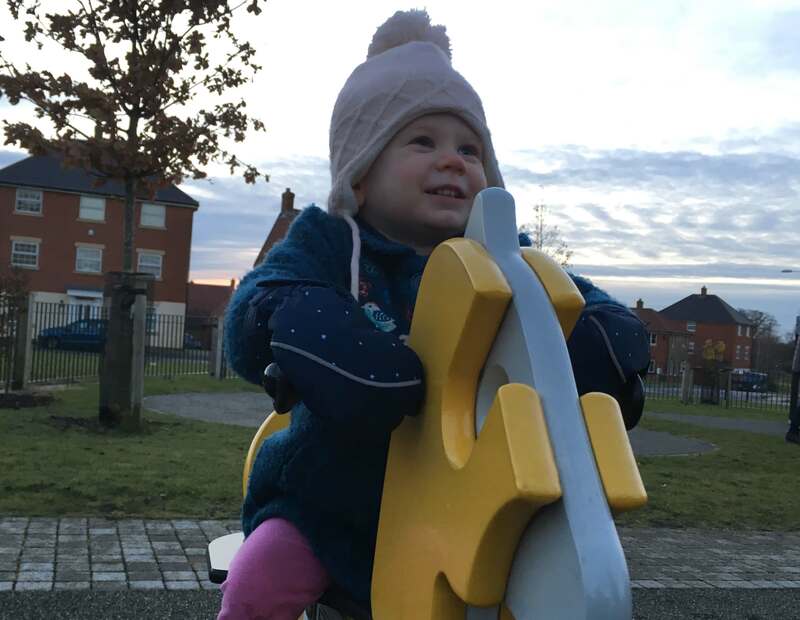 The cold didn’t deter M and she had a whale of a time playing on the swings, the bouncy animals and the slide. She doesn’t like sliding down the slide but loves to try and climb it from the bottom (not that she ever gets very far)! Eventually the chilly weather got the better of us and we headed home to warm up with a lovely roast dinner. "You’ve Had a Bad Day…"
"Gender Reveal – Baby Number Two"
Oh we appreciate how lucky we are with her new-found love of hats – she had a very red head in the summer as she point blank refused to wear her sun hat! Lovely photo. Whatever the weather the park is always a hit. It’s so nice to get out and get some fresh air. Thank you! Yes, it is. I’m making it one of my goals next year to try and get out and about more.